Allegaar is a small coffee table that will serve as a colorful and intriguing addition to your living room or coffee corner. Despite its humble size, it is composed of four (!) different types of wood: ash, elm, walnut, and maple. It is this quality that has given this piece its name; Allegaar comes from allegaartje, a Dutch word referring to a mixture of things. Each of these wood types adds its own beauty to the piece, but the ash table top will probably attract the most attention. It has a beautiful figure with curious color movements and flame-shaped patterns flowing from end to the other. The table top rests on an equally alluring leg framework, displaying the contrasting colors of elm, walnut, and maple. It also features Espenaer’s signature triplets sticks. The table top consists of three boards laterally attached to one another and arranged in such a way to emphasize the grain pattern in the wood. The leg framework is composed of an outer frame made from elm and in-between parts, featuring Espenaer’s triplet sticks, made from walnut and maple. All components connect to one another through blind mortise and tenon joints. 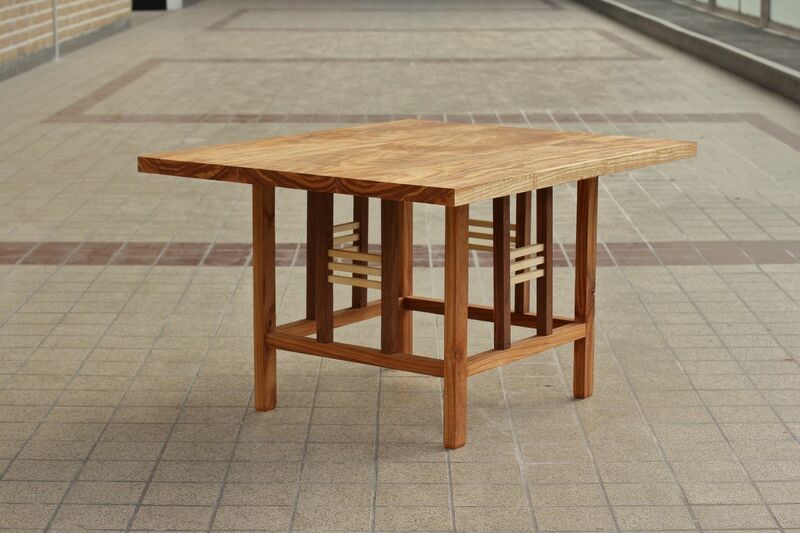 The table top is fixed to the leg framework with cleats, which allow for the seasonal movement of wood. Allegaar was entirely made by hand using traditional hand tools and techniques. The table top was cut from a single board of ash with a Western-style saw and subsequently planed flat with a combination of Western-style hand planes. The components of the leg framework were cut from elm, walnut, and maple boards with a combination of a Western-style backsaw (for crosscuts) and a Japanese ryoba saw (for rip cuts). The parts were subsequently planed to dimension with a Western-style hand plane. The mortise and tenon joints were cut with a set of Western-style chisels and a fine dovetail saw. All parts were smoothed with a finely tuned metal scraper and subsequently finished with three layers of pure Tung oil.